Large, lop-eared, and docile, Large Blacks are a fabulous heritage breed of pig that thrives on pasture. Their black skin helps protect them from the harsh Uruguayan summer sun. The breed originated in Britain, one of the most popular and numerous breeds prior to World War II. Unsuited to intensive, indoor production, the breed lost favour, but not before being exported abroad. The Large Black is best known for its foraging abilities and its maternal qualities. 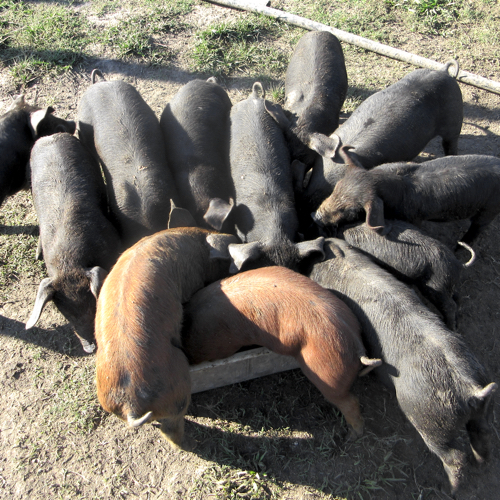 New to our farm in 2015, our sounder started out as three sows (two pregnant) and a young boar. After two litters, we are slowly increasing our breeding numbers. Long term plans include charcuterie and fresh pork. Current activities involve slowly expanding permanent infrastructure to facilitate rotational grazing, year-round farrowing pens, and utilizing hogs for weed management in the olive orchard.